The In Flanders Fields Song (available on CD or as an MP3 download) is a contemporary music adaptation by Canadian composer Anthony Hutchcroft of John McCrae’s In Flanders Fields poem. The Flanders Fields music was created to be more accessible for all and designed to appeal to all ages. The In Flanders Fields Song was written to help bring the Flanders Fields poem to a wider audience and to a younger audience. Hutchcroft created the In Flanders Fields Song after reading a poll by Toronto’s Dominion Institute that stated more than 50% of Canadians aged 18 – 24 years were not aware of the In Flanders Fields poem or the poem’s Canadian author John McCrae. 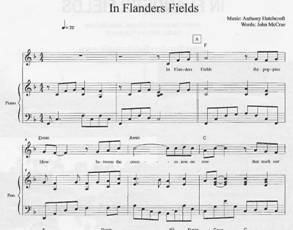 Start this lesson by playing the CD recording of the In Flanders Fields song and reviewing the text in Data Sheet #5. This lesson will introduce students to the story of what inspired Canadian composer Anthony Hutchcroft to set the In Flanders Fields poem to music. 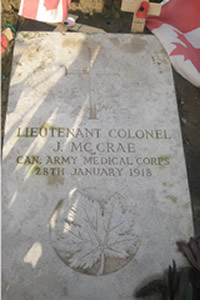 Students will also explore how the composer approached the arrangement to accurately reflect John McCrae’s military heritage and Scottish background. Hutchcroft completed the In Flanders Fields song, his musical adaptation of John McCrae’s war memorial poem IN FLANDERS FIELDS on November 12th 2006, the day after Remembrance Day. Share the information in Data Sheet #5, “The Story Behind the Music” with your students. What prompted the composer to create a musical adaptation of the In Flanders Fields poem? How does the composer reflect through music, John McCrae’s Scottish heritage and military background?